The quantity of water found was small, but could become a useful resource. 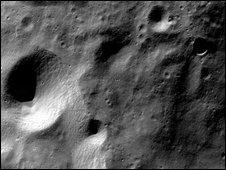 Indian Space Research Organisation (Isro) chief G Madhavan Nair said a spacecraft probe found more water on the Moon "than was expected." The mission was terminated last month after communication was lost with the orbiting spacecraft. The craft was launched last October for a two-year mission of exploration. Data from three spacecraft, including India's Chandrayaan probe, has shown that very fine films of H2O coat the particles that make up the lunar dirt, US space agency Nasa announced. The quantity is tiny but could become a useful resource for astronauts wishing to live on the Moon, scientists say. "We truly believe it is a path-breaking finding. But this is just the beginning," Mr Nair said. "Indians should be proud of the fact that the Chandrayaan enabled the discovery of water on the Moon," he said. Indian scientists have welcomed the discovery and said more studies needed to be done to find out how much water was available and whether it was fit for human consumption. "The results suggest that frost rather than water is present in the form of a thin film on the lunar surface. The quantity and its distribution across the Moon is still an open question," K Kasturirangan, a former chief of Isro told the Press Trust of India press agency. "Ultimately, in the long run if humankind has to go and inhabit the Moon, one of the important requirements is that you should have adequate water for survival," he said. An Indian scientist working in Nasa said it was a "significant discovery"
"It is a very significant finding if we ever are to venture out to set up a base anywhere in the solar system, the Moon is the nearest destination," Amitabha Ghosh said. The Indian media has also hailed the role of Chandrayaan in the finding. One Big Step for India, A Giant Leap for Mankind, headlined The Times Of India newspaper. "[The finding] has helped shake off the failure tag from the Chandrayaan project that was aborted last month," the paper said. The mission was expected to cost 3.8bn rupees (£45m; $78m), considerably less than Japanese and Chinese probes sent to the Moon last year. But the Indian government's space efforts have not been welcomed by all. Some critics regard the space programme as a waste of resources in a country where millions still lack basic services.